A rare glimpse into a photo session and 8mm video of Dear World with Kurt Peterson and Angela Lansbury. Kurt’s NY BOUND solo musical memoir, Proud Ladies: Close Encounters With and Lessons Learned From will be workshopped Aug. 13-18 at Columbus, GA's Springer Opera House, directed by Lisa Asher, with choreography by Joshua Bergasse, and music direction by Ian Herman. Projections are by Telegraphicmedia. The show will be produced by James William Productions and Stephenie Skyllas/Over~Sky Productions. While Kurt is the only physical actor in this show, the 23 proud ladies loom large and act along with him through the use of multi-media depictions. This artful use of images, some never-before seen, bring these dynamic women to life. The audience feels their presence and the impact these women had in shaping this man's view of the world, as well as himself. Kurt and other members of the original cast of Follies will headline a very special panel at BroadwayCon! We are so thrilled to announce that Kurt will be reuniting with several cast members of the original Follies at BroadwayCon on Saturday, January 27th at 3 pm to discuss when "Everything Was Possible!". More information and tickets here! Zero Hour ended it's successful run (just for now) with a wonderful talk back with a man who knew Zero Mostel well, and who has given us all so very much. Make plans to see the long overdue salute to Hal Prince, The Prince of Broadway, coming soon. Kurt is thrilled to be moderating a talkback with the man who more than anyone else has inspired his producing efforts... Hal Prince! Come see the final performance of Zero Hour at 3 PM on Sunday July 9 at the Theatre at St. Clements and hear what Hal has to say about Zero ...and what Kurt has to say about Hal. Read more in BroadwayWorld, and be sure to come and see original star Jim Brochu at the Theatre at St Clement's from June 2nd (opening June 14th) to July 9th. BIG news for the Voice Studio and JWP! We are firmly ensconced in our brand new, beautifully renovated, light and bright, ALMOST completely decorated studio 2B - we are now occupying the ENTIRE commercial 2nd floor of the historic "Wyoming" building on 7th ave. Some rooms available for rental. Come see us in 2A and 2B soon! Check out the beautiful work of Doug Reside, curator at the Billy Rose Theater Division of the Lincoln Center library - many more GIFs of the original and 1968 productions of West Side Story right here! In 1977, the late Clark Gesner (composer of You're a Good Man Charlie Brown), asked Kurt to record a demo of a brand new Christmas song for Bing Crosby. Sadly, Bing passed away just a few weeks before the session - it would be the "last Christmas song Bing never recorded" - but now you can hear the lovely "All Kinds of Christmases" sung by Kurt, with orchestrations and piano by Rick Jensen. Happy Holidays from all of us at JWP and The Voice Studio! People are talking about WEWP. . . NOW in its second pressing! New York, NY (5/18/2016) – Ghostlight Records released the concert recording of When Everything Was Possible, an exciting and poignant evening celebrating Broadway’s Golden Age starring Kurt Peterson and Victoria Mallory and directed by Larry Moss, on May 13, 2016. 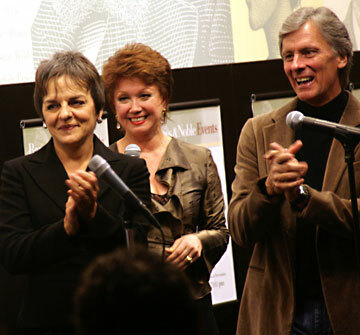 The beloved performers – who appeared in the original productions of the classic musicals Follies, A Little Night Music, Dear World and Sondheim: A Musical Tribute, among many others – reunited at New York’s City Center in 2012 and this live album memorializes that special evening, Victoria’s last New York stage appearance. When Everything Was Possible includes songs from shows they appeared in either separately or together between 1966 and 1974, in addition to two new compositions. To order the album, please visit www.sh-kboom.com/everything-was-possible. When Everything Was Possible features selections from landmark works of musical theater, along with hilarious and personal memories from the stars themselves, to offer a walk down Broadway’s memory lane. The concert has new orchestrations by Jonathan Tunick, music direction by Michael Rafter, direction by Larry Moss, musical staging by Joshua Bergasse, historical projections by Telegraphic Media, original songs by composer Jesse Wiener, and an introduction by Ted Chapin, President of the Rodgers & Hammerstein Organization. The album is produced by James William Productions and Stephenie Skyllas. For more information, please visit www.WhenEverythingWasPossible.com. Congratulations to Studio teacher Arthur Levy, who coached the marvelous Meryl Streep to be "just short of the mark" for her role as notoriously terrible amateur singer Florence Foster Jenkins. Arthur attended the opening with Meryl - and we're JEALOUS! Q: What could legendary classical actor Vincent Price and Broadway juvenile Kurt Peterson possibly have in common? A: Both tried to save the failing Peter Paul candy bar "No Jelly" in 1972. The bar failed, but Kurt and his commercial won the "CLIO Award" for Best Commercial. 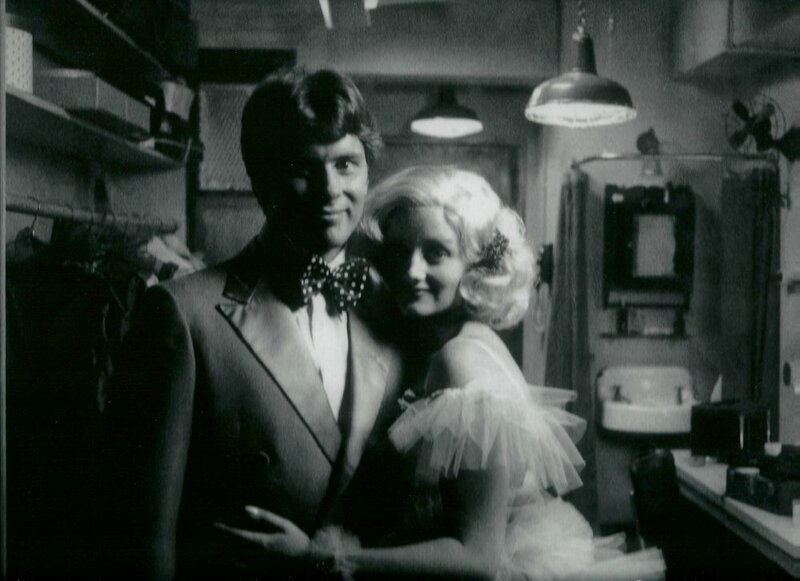 See "Mr. Peanut Butter" Kurt and "Miss Jelly" Erika Peterson in this classic backstage drama. This is a more "New York Apartment friendly size replica of the iconic"scrabble" poster the Huffington Post recently described as "The revelatory first (and still reigning finest ever) all-star Sondheim concert"
Victoria Mallory and Kurt recreated the balcony scene from West Side Story at Seth Rudetsky’s Chatterbox in New York on March 26 for the first time since starring in the Lincoln Center revival in the summer of ’68, forty-one years ago. Thank you Seth, for recently posting the entire Chatterbox interview as a memorial to Victoria. How fun it is to see the 1973 Warner Brothers promo documentary of the first celebration tribute to Stephen Sondheim. JWP has been trying to find the lost footage, but this one is great fun as you see, Chita, Angela, Donna, Stephen, and many more in their younger days. On Sunday, April 29th, 2012, When Everything Was Possible – A Concert (with comments) debuted at New York City Center. Kurt Peterson and Victoria Mallory, Broadway’s go-to juvenile and ingénue of a Golden Era, were welcomed back to the New York stage in a memorable evening of song and story. With Orchestrations by Jonathan Tunick, Music Direction by Michael Rafter, Musical Staging by Joshua Bergasse of NBC’s Smash, Direction by Larry Moss and never before seen images from the era’s greatest photographers, When Everything Was Possible revisits a powerfully charged time of American and world history as well as the sunset years of the Golden Age of Broadway. The concert featured songs from shows they were very much a part of including West Side Story, Dear World, Carnival, Follies, A Little Night Music, Sondheim - A Musical Tribute and more. Opening night of the Kennedy Center production of Follies on Broadway at the Marriott Marquis with original cast members in attendance. To watch Kurt, Virginia, Harvey and Marti perform "You're Gonna Love Tomorrow" from Follies on the David Frost show circa 1971, click here to view. It begins at 1:03:40. JWP is proud to announce the title of Kurt’s new concert with Victoria Mallory: When Everything Was Possible! Kurt and Victoria are thrilled to have obtained the rights from composer and lyricist Stephen Sondheim for the use of a well-known lyric from Follies, as well as from Ted Chapin, the President and Executive Director of The Rodgers & Hammerstein Organization and author of the book i. The Zero Hour Tour Has Begun! JWP is proud to be co-producing the Drama Desk and Helen Hayes Award-Winning hit play Zero Hour, based on the life of Zero Mostel, written by and starring Jim Brochu with direction by Piper Laurie. Visit www.zerohourshow.com for our tour schedule and for links to purchasing tickets. 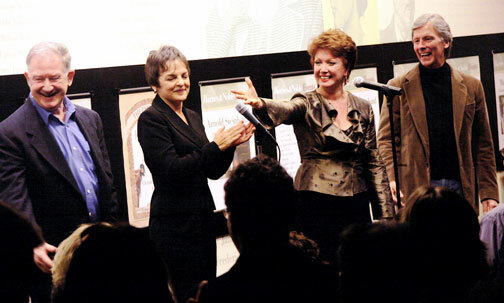 Also visit Broadway.com, Variety.com, Playbill.com, and Broadwayworld.com to read all about Zero Hour. JIm Brochu as Zero Mosel in Zero Hour. of Broadway's newest production of West Side Story. where Kurt and Victoria made their debut 4o years before. To honor Stephen Sondheim on his 80th birthday, Kurt Peterson and his company, James William Productions (JWP), has re-issued a special limited edition of the poster designed for “Sondheim: A Musical Tribute,” the first celebration and revue of the music of Broadway legend Stephen Sondheim. Produced by Mr. Peterson, the Tribute was held on March 11, 1973, at the Shubert Theater on the set of “A Little Night Music.” What began as a mere luncheon soon grew into a three-hour concert with forty-one songs performed by thirty-eight singers, all Sondheim show veterans. The famous poster, using Scrabble® squares to spell out the names of Sondheim shows, was designed by Neil Appelbaum and was given to the cast of the historic concert. The poster has never been available to the general public. The poster is also available through Triton Gallery in New York City at 800-626-6674 or on-line at www.broadwayposters.com. Kurt, his Follies pal Harvey Evans, and Stephen Sondheim have cameo moments on the recently released new Rodgers and Hammerstein recording of Allegro. Capture Now is the story of the relationship between two young brothers, the "coming of age" of the older brother and the love of the family and friends who help move him through difficult times...an understatement. Josh Jonas was born and raised on Long Island and attended Boston University where he received his BFA in acting. His other writing credits include the one acts Elvis Savant and No-Hitter. He was see in the New York premieres of Belly of The Whale and Divinity Bash and was also the lead in the film Worn Like a Tattoo with Billy Drago. Visit the CAPTURE NOW production page for additional links and photos. Cady Huffman, Kurt and Larry Moss at opening night of Capture Now. Captain Louie, the wonderful Stephen Schwartz family musical co-produced by JWP has now been released and is being licensed by Music Theatre International. In both the Broadway and Broadway Jr. versions, the show is now available and being staged by young performers for audiencesaround the world. Check the website musicalschwartz.com/captain-louie.htm for information and locations. at 8 PM on Wednesday, July 30th at The Zipper Theater in NYC. "I have known Ian and his work for many years and I find his playing and especially these energetic, fun and moving pieces, extraordinary. It is going to be a wonderful evening and I'm proud that JWP is involved in helping to bring Ian and his talent to the stage." Kurt. To see photos from the evening, click here. Vicki starred in at Lincoln Center in the summer of '68 . Ramona, of course, is Vicki's talented daughter. Kurt participated in Donna McKechnie's book tour promoting her autobiography, Time Steps. Donna McKechnie, Harvey Evans, Eugene at the piano. The 92nd St Y hosted a private preview screening of the PBS documentary – Words and Music by Jerry Herman, a film by Amber Edwards. 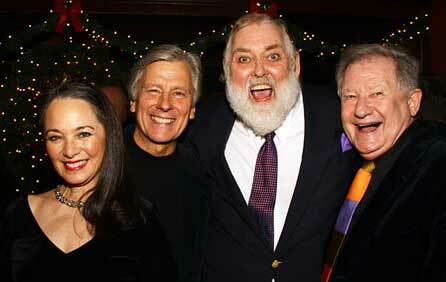 of the smash hit shows Hello, Dolly!, Mame and La Cage aux Folles. Words and Music by Jerry Herman will be aired continually on PBS. Kurt, of course, was in the non-hit Jerry Herman show, Dear World.